Many people have died while trying to rescue others caught in rip currents. Don’t become a victim yourself. The most effective defense against drowning is closely watching people in your party. Throw anything that floats to the person in trouble, like a life ring or cooler. Seek help from park staff, friends or others. Ask others to stay away from piers and breakwalls. Pay attention to warning flags. Many public beach areas use color warning flags to alert swimmers of dangerous conditions. Green = Go. But stay aware of changing conditions. Yellow = Caution. Watch for rip currents. Red = Stop. Stay on the beach and out of the water. A red flag means that swimmers are in danger of drowning due to rip currents or other hazards. Dangerous currents are often present near structures, regardless of weather conditions. Stay calm: Fear, panic and exhaustion can be a deadly combination. Focus on breathing and keeping your head above water. Swim to the side, then back to shore. If tired, switch between swimming and floating until you reach shore. If in danger: Face the shore and call for help. Take swimming lessons and become a stronger swimmer. Protect children from dangerous currents and breaking waves by having them wear life jackets. Swim in designated beach areas and stay 150 feet away from piers and breakwalls. Check the beach forecast (see below) before heading out and pay attention to warning flags throughout the day. Recognize the signs of drowning (see below) and learn CPR. Drowning may not look like you think. When drowning is portrayed in fictitious situations like movies, it often involves the drowning person splashing and making noise, calling out for help. However, in most real situations, drowning can be a quiet affair with people nearby not recognizing that a person is in trouble. 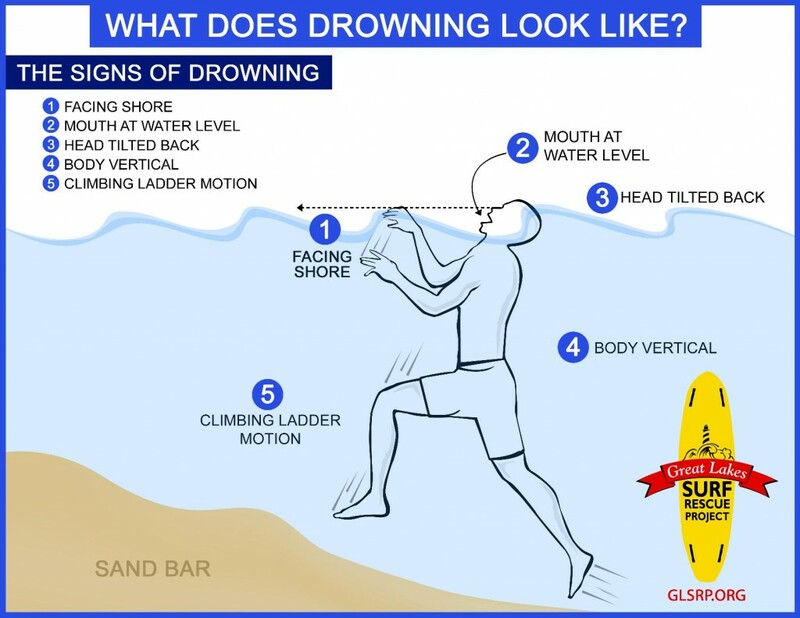 Learn the signs of drowning, illustrated here. The signs of drowning may not be as dramatic as you’ve been led to believe. Graphic courtesy of the Great Lakes Surf Rescue Project. Check the weather before heading to the beach and pay attention to any warnings that may be posted. Beach Safety and Dangerous Current awareness is part of a state and regional effort led by Michigan Sea Grant in collaboration with the NOAA-National Weather Service, the Michigan Department of Environmental Quality (MDEQ), the Michigan Department of Natural Resources, Michigan Technological University and others. The MDEQ Coastal Management Program supported the development of many educational programs and public outreach products.